One of our greatest joys as grandparents is introducing our grandkids to the wonders of children’s literature. From Winnie the Pooh to Corduroy to The Hungry Caterpillar, we enjoy once again, the magic of a good book. 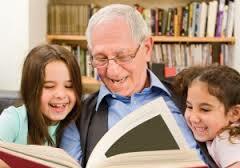 You may be fortunate enough to spend many hours with your grandchildren, reading to them at nap times and bedtimes, or, as so many of us, you may be a long-distance grandparent. Either way, you can make sure good books are in your grandkids’ hands. Books make wonderful gifts and you can also keep a mini-library of favorite titles in your home for those special family visits. Here are some guidelines to help you choose top quality reading next time you visit your local library or purchase a book for your grandchildren. You probably remember many good children’s authors from the days when your own children were little ones. The characters in these books became your child’s friends: Ramona, Charlotte and Wilbur, or Little Bear. But there are many newer authors with great characters, strong storylines and good lessons to be learned. The ALA, the American Library Association (www.ala.org) offers a list of great children’s authors and you’ll find a list of 75 children’s authors and illustrators at www.readingrockets.org. In the U.S. there are two major children’s literature awards given annually, The Caldecott Medal for illustrations and the Newbery Award for outstanding story. In the U.K. there are similar awards, the Kate Greenaway Award for illustrations and the CILIP Carnegie Award for best book of the year. There are other awards given by various agencies, such as the Parents’ Choice Award and the Laura Ingalls Wilder Award. In general, if you see an award sticker on the cover of a children’s book, you know a group of literary professionals found that book worthy. Children often go through periods of time when they only have eyes for superheroes, firefighters, or dinosaurs. Their favorite “thing” is on their minds and in their talk, day in and day out. Learn to strike while the iron is hot and provide reading materials on their current favorites. Even kids who don’t choose reading as their favorite activity will get into a good book on their current favorite topic. The Poky Little Puppy, Make Way for Ducklings, Little House in the Big Woods—do any of these ring a bell? If so, it may be because these titles were on the market when your children were young. When a book remains popular over generations, it’s a good bet your grandchild will benefit from hearing that story, too. The classics have stood the test of time. They have characters with endearing traits, story lines that compel readers to care and themes and values that inform one generation after another. For a complete list of children’s classics, go to www.goodreads.com and search for children’s classics. 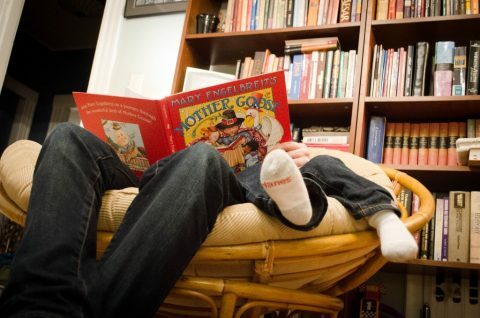 You’re a lucky grandma or grandpa if you get to read regularly to your grandchildren. Enjoy each and every session and be sure that the books you choose are just as special as they are. And if your grandkids live far away, surprise and delight them with gift books of top quality. You might even make a recording of a favorite book and send it along with the book, itself. Then the grandkids can enjoy hearing your voice as they read along. Good literature is one of the best gifts we can give to younger generations.